Patriots beware! ANTIFA plans armed uprising on November 4! Violence and mayhem are planned for Nov. 4. America is poised for revolution, and a date has been set, November 4, 2017. This isn't a viral marketing campaign for an action movie, or fake news. The terrorist organization, ANTIFA has announced the date on their website, and they are hoping to incite violence and chaos, with the aim of overthrowing the democratically elected government of the United States. Odds are, they will fail, especially since their plans are known. But it is still a disturbing development. LOS ANGELES, CA (California Network) -- There is a terror organization made mostly of millennials, and they are ready to stage a revolution in the United States on November 4. Known as ANTIFA, which is short for 'Anti-Fascist,' the organization is distinctly anti-Trump. Its membership rosters have exploded since the 2016 presidential election. ANTIFA's roots date back to the 1920's when they clashed with Hitler's Brown Shirts in Germany and Mussolini's Black Shirts in Italy. Since then, the organization has been a fringe movement, with few members and no attention. The election of Donald Trump, which has polarized millions of Americans, has infused the organization with new life. The organization is leftist, and is associated with communist ideology. They are also violent, by design. They train members to disguise themselves and to engage in street combat. Investigations by both police and independent journalists reveal they are armed and seek to do mayhem and violence. They use encrypted messaging apps to communicate, code names for one another, and they perform background checks on their new members. They avoid cameras, preferring instead to remain anonymous. They have a public side with a few photogenic representatives who claim to speak for the organization, but most members are anonymous foot soldiers. The Department of Homeland Security has already launched an investigation into the organization for domestic terrorism. ANTIFA runs riot during a protest. The foot soldiers remain anonymous and have one aim, which is violence. ANTIFA in the USA seeks the overthrow of President Trump by violent means. This is the aim of the November 4 revolution. Their website is filled with information and fliers. They ask for donations. So how is it that an army of unemployed millennials can set up a website, organize national protests, print propaganda, train and equip members from their parents' basements? The answers is, ANTIFA is financed by a higher-level organization. Although ANTIFA is an old organization, it is a new threat. Just how it's financed and organized is not widely understood. But if we look at the ideology of ANTIFA, we see who aligns with them politically. 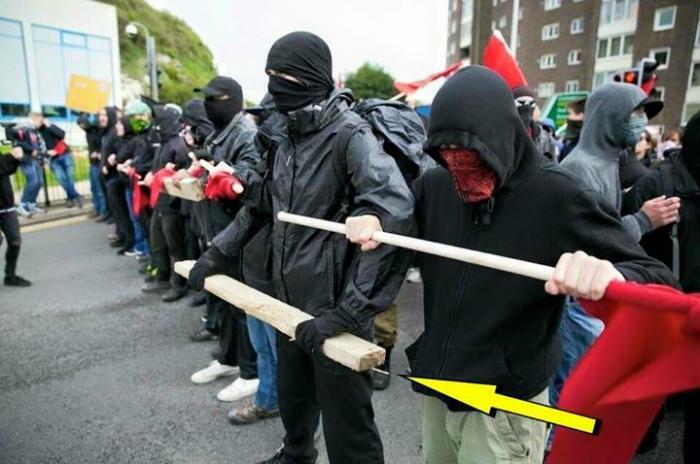 ANTIFA members are often armed, even if in subtle ways. Their goal is to do harm, without being caught. On the street, they are aligned with Black Lives Matter, an organization which aims to being attention to the unique challenges faced by blacks in America. However, the organization has been tainted by violence at their rallies. It is unclear if the organization itself is responsible for the violence, or if rogue members are to blame. Also aligned with the organization are politicians, such as Obama, Clinton, and financier, George Soros. Obama has been accused of fostering racial divide. Clinton, is infamously unscrupulous and corrupt, and enjoys the support of George Soros. As for Soros, he appears to be the purse behind a number of radical, leftist organizations. Although no direct link has been found between Soros and ANTIFA, it has been widely suspected and inferred. Soros has been known to funnel money to paid protestors, and ANTIFA members who say they were not paid as promised were recently caught protesting Soros and their missing paychecks. You do the math. As for November 4, ANTIFA's own literature states they seek the removal of President Trump and his vice president, Mike Pence. They seek to accomplish this by violence. They are openly encouraging other Americans to join them. This is sedition. On November 4, it will become treason against the Republic, and a democratically elected, sitting president. It may be that some people do not like having Donald Trump as president. However, the way to deal with an unpopular president is not insurrection. It is to vote for a change in the next election. Our founding fathers, in their wisdom, included in our Constitution a mechanism whereby the American people could stage a bloodless revolution every four years. That system still works. The people who want to break that system are not patriots. They do not love their country or respect the Republic, or the office of the president. They do not respect you, and if you do not support them, they think nothing of harming you. Typical communists. This November 4, we pray for peace, and encourage all Americans to be prepared. If you have information about planned violence, arms trafficking, or other illegal activity, you are strongly encouraged to contact your local authorities.